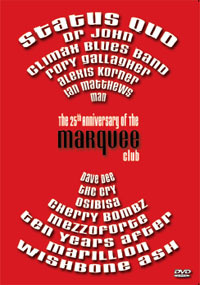 London’s MARQUEE Club celebrated its 25th Anniversary in 1983 and this DVD features performances from bands and artists that have performed at one of the longest established venues in rock history over that period. The Marquee was a launching pad for many of the world’s biggest bands and artists. Also included alongside the full performances of the listed below artists are interviews with PHIL COLLINS, KENNY JONES, DAVE DEE, ALEXIS KORNER, CHRIS BARBER reflecting on their appearances at The Marquee. Also appearing on the DVD are a rockier Status Quo and Welsh band Man, sitting alongside the New Orleans legend Dr John and 1960s pop star Dave Dee. This DVD encompasses all the styles of music you would find at the club, enhanced by reminiscences with some of the artists. ...this enjoyably dated film makes for good entertainment, being informative of period, revealing of participating artists and (albeit unintentionally) amusing.